The Up-Rite Adjustable Height Sit & Stand Desk is a simple to use, ergonomic solution to add energy to your working environment. Mobile and easily adjustable from sitting to standing, even for tall people, the Up-Rite Desk helps you Get Up, Stand Up™! The desk height adjusts from 26″h to 43″h allowing the desk to be used as either a sit down or stand up workstation, encouraging efficiency by letting you refresh your position in the office, classroom or training room. Height adjustable from 26″ to 43″ allows the desk to be used as either a sit down or stand up workstation, encouraging efficiency by letting you refresh your position. 26.6″w x 20″d x 26″h – 43″h Weight: 30 Lbs. The Up-Rite Desk is the energetic addition to compliment any classroom. With full sit to stand adjustment, you can adjust for virtually any height, activity and position at the flip of a lever. Simple to make a collaborative configuration with two casters and two stabilizing glides, just tilt and re position. Standing Desks are well known to contribute to more productivity, better posture, less energy dips and a variety of other benefits. You will also have a space saving design and superior maneuverability in the classroom. Features a 1.13″ thick Hi-Pressure Top Panel available in eight different laminate colors and patterns. Top measures 26.6″w x 20″d. TAA compliant. Patent pending. Has achieved GREENGUARD GOLD Certification. Our innovative Up-Rite Pneumatic Height Adjustable Stool is designed for use with a sit to stand desk or workstation. Get the versatility of standing while relieving the stress associated with being on your feet. Built from rugged materials, stool is designed for long lasting performance in any environment, including industrial, educational, commercial, or medical settings. Daily cleaning: Daily cleaning can be performed using a clean, soft cloth and mild all purpose-multi surface household cleanser. For tough stains: A simple mixture of baking soda and water applied directly to the stain then removed with a damp cloth will generally work very well. Avoid using abrasive bleach based cleansers on laminate and melamine surfaces. Never use scrub sponges or steel wool on laminate and melamine surfaces. Waxing: There are special waxes for laminate and melamine surfaces that can help create a protective barrier to stop stains from sinking in and keep your product looking new for years to come. Email for your Free Quotation! Our Electric Height Adjustable Tables allow you to move from sitting height to standing height at the push of a button. Available in a range of sizes and finishes, Single Level Tables give you choices that fit into your space and budget. 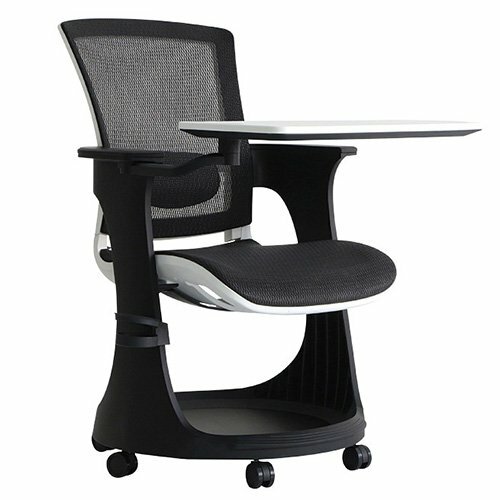 Electric Height Adjustable Table, Dual Level, sit to stand tables with separate height and tilt adjustment on the front keyboard surface. Put monitors and keyboards at the right position for you so you are comfortable and productive all day. Our Compact Series of Sit Stand Desktop Converters are compact, modern, and easy to use and are ideal for corner cubicles or limited space. They provide the same sturdy desktop in a slimmed down design. Instead of selecting from predetermined heights, you can easily adjust the standing desk to match your exact height requirements. The keyboard tray allows for negative tilting, keeping your wrists in a neutral position. These workstations are cost effective, ergonomic solutions that turn your Desk into a Sit Stand Workspace with ease. Our Mesa Series Folding & Nesting Tables are mobile in order to arrange independent or collaborative spaces instantly. Productive environments must have the flexibility to reinvent spaces quickly and spontaneously. Each day brings a variety of activities and needs. For weekends or evenings when more floor space may be needed, simply roll them in place, and they fold and nest neatly until they are called into action at a moments notice! Mesa Series Desk, Tables, Pedestals and Mobile Utility Stations create a coordinated series diverse enough for any space. Ideal as a stand alone or grouped to create the ultimate training lab. Mobile Cabinets and Locking Mobile File Pedestal for all your storage needs. The HG Wall Mount Workstation is the most versatile set and forget wall mount workstation available, featuring a wide range of one touch adjustments with no buttons, knobs, levers, or switches. Use just one hand to adjust tilt, swivel, and pan on each of the arms. Spring-loaded joints ensure the arms stay in place, yet are easily repositionable. Ideal for use as nurse’s workstation medical facilities, warehouses, or other high traffic areas where computer access for multiple operators is needed, this space saving station has a comprehensive array of adjustment ideal for virtually any user. 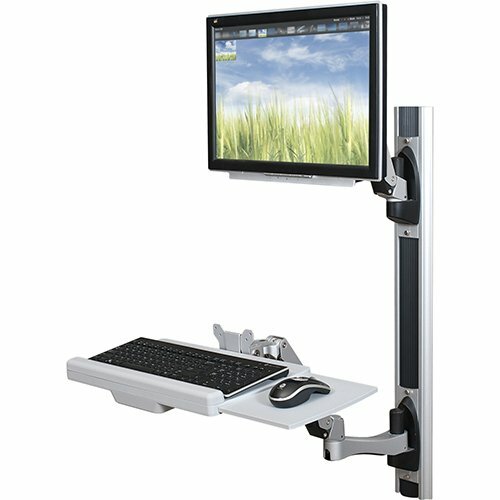 The Wall Mount Workstation includes the monitor mount, keyboard mount and wall mounted base track with cable management channels. You can also add an optional second monitor mount and/or CPU mount. Mesa Series Teachers Desks, Tables, Pedestals and Mobile Utility Stations create a coordinated series diverse enough for any space. 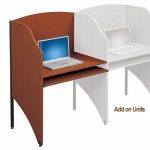 Ideal as a stand alone or grouped to create the ultimate training lab for the ideal fit into your productive work space. email Bakagain for a Quote today! The contemporary Endure Standard Height Table Seats on 1 Side design allows you to sit or stand while you brainstorm. Choose the Dry Erase Whiteboard tabletops and get sketching. Time to share and collaborate? Stow the stools under the table tops and co-workers have freedom of movement around the table to share ideas unencumbered by seating. All the while your mobile device is being charged using the built-in electric / USB charger. Our 41″ Corner Sit-to-Stand Workstation provides an easy way to transition between sitting and standing throughout the workday. Our spacious desks offer a deep work surface, a wide keyboard and instant tablet integration. These quality workstations offer smooth up and down motion, twelve height adjustment settings and ergonomic monitor mount compatibility. Practically an office on wheels, the Eduskate Mobile Tablet Chair was designed as a personal work space for learning. Delivering both comfort and support, it has no hard edges or right angles to deliver an approachable, contemporary look and feel. A mesh back and mesh waterfall seat keep students cool, comfortable and attentive throughout classroom courses. Email us to receive your Free Custom Quotation, Bulk Discount, and Free Shipping!